Essen Restaurant and Beer Cafe, located on Broadway in Ultimo, is one of those perfect restaurants for the cooler months: full of comforting, moorish, gratifying meals. Essen dishes up Northern European cuisine: food that tends to conjure up images of noisy beer halls, such as Sydney’s infamous Lowenbrau. But unlike places of a similar vein, Essen has a genuinely warm and home-style disposition. It’s also clearly a restaurant that takes pride in it’s varied beers, as opposed to a beer hall that happens to serve food. Speaking of beers, Essen has a beer list that would make my beer loving-and-brewing father proud, and my friend Rachel (my lovely dining companion for the evening) and I each enjoy Franzisaker wheat beers (mine with a shot of mango, which just makes it slightly sweeter without making it syrupy). For those who aren’t into beer, there are ciders, a selection of wines, non-alchoholic drinks, and of course – a schnapps menu. We start with a poached, shredded chicken salad mixed with celeriac, sour cream, caper, and dill, and served with organic pumpernickel ($11). While it’s called a salad, it’s more of a spread for the pumpernickel – it’s served cold, and is dense and creamy. The capers provide a sharpness and saltiness to the dish, making it an appetising starter. Rachel and I love bread and cheese something fierce, so ordering the Kobil Brot (swiss style garlic bread with smoked paprika and gruyere cheese, $4.50) is a no-brainer. We aren’t disappointed – the bread manages to retain some crispness despite being smothered in melted gruyere, and the paprika makes an otherwise standard dish that little more interesting. The waiter reads our table well, and recommends we also try the deep fried camembert with cranberry compote ($11). Perfectly crispy on the outside, the camembert melts in your mouth in a way that has you thinking, if Heaven comes in two-bite-sized pieces, this is absolutely it. A fresh baked brezel served with butter ($3.70) also makes its way to our table. Those who have spent time in North America will be familiar with them as the large, warm pretezels vendors sell. It doesn’t disappoint – bready on the inside, and golden and salty on the outside. Café Essen runs a competition called ‘Schnitzilla’ – if you eat a 3.5 kilo chicken schnitzel with sides of cabbage salad and roesti within 45 minutes, it’s on the house (additional rules apply). Rachel and I don’t go for the challenge, but share the standard chicken schnitzel served with Dianne sauce ($19.50). It comes on top of crispy potato roesti, and is accompanied by a side of cabbage salad. The cabbage salad is fresh, and is the perfect foil to the moorish roesti. The schnitzel itself is breaded the perfect amount: enough to provide a crisp and slightly salty armour to the perfectly cooked chicken, but not so much you feel inundated by the breading. Schnitzels are a huge component to the menu, and are also available in veal or pork, with five different types of sauces to choose from. 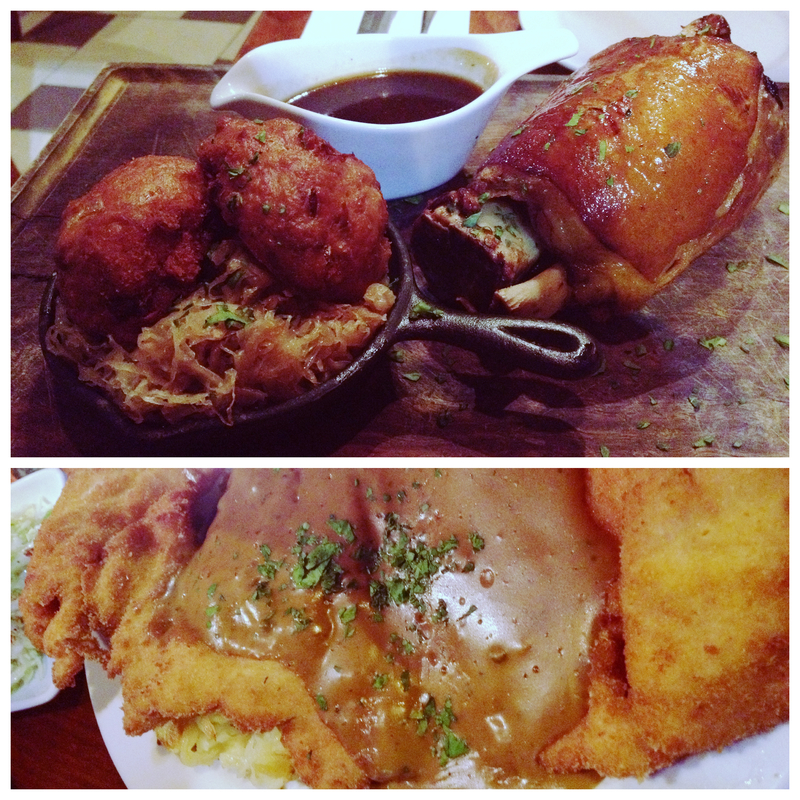 At the waiter’s suggestion, we also share the Pork Knuckle ($29.50). Marinated in a honey, thyme and rosemary brine, it’s slow roasted for three hours. The pork literately falls apart when you break it with the side of your fork, and the brine gives a slightly sweet edge to the meat. It’s served with a bread dumpling, gravy, and a personal favourite – saukerkraut. The saukerkraut is a treat, it doesn’t taste as salty or processed as many of the grocery store brought concoctions, so you’re able to enjoy more of it alongside the pork. Even though Rachel and I felt like we might need a crane to lift us from our seats, we can’t help ourselves – we order the apple and pear strudel. 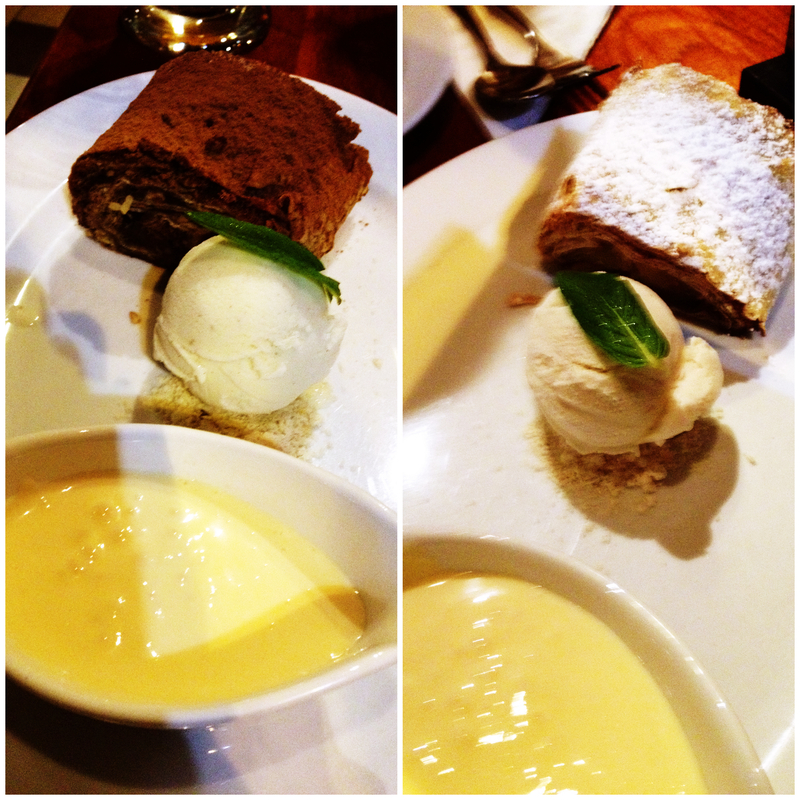 Our waiter tempts us with the mention of the chocolate and hazelnut strudel, and we only take a second to cave. They both come with a scoop of vanilla-bean ice-cream and custard. The ice-cream and custard are both perfection: light, fresh, and sweet. The pastry of the strudels is mouth-watering, and the filling in the apple and pear strudel is sweet and zesty, while the chocolate and hazelnut is reminiscent to a more sophisticated nutella. It’s impossible to choose between the two, so if you’re lucky enough to have a friend or two to share with, definitely get them both. The wait-staff are prompt, friendly, genuine, and knowledgeable. They are able to answer all of our questions with a smile (and none of the ‘let me check with the kitchen’), and are happy to offer suggestions, without seeming pushy. They also have great timing and presence – we were never left wondering where they were, nor did we feel like they were hovering. 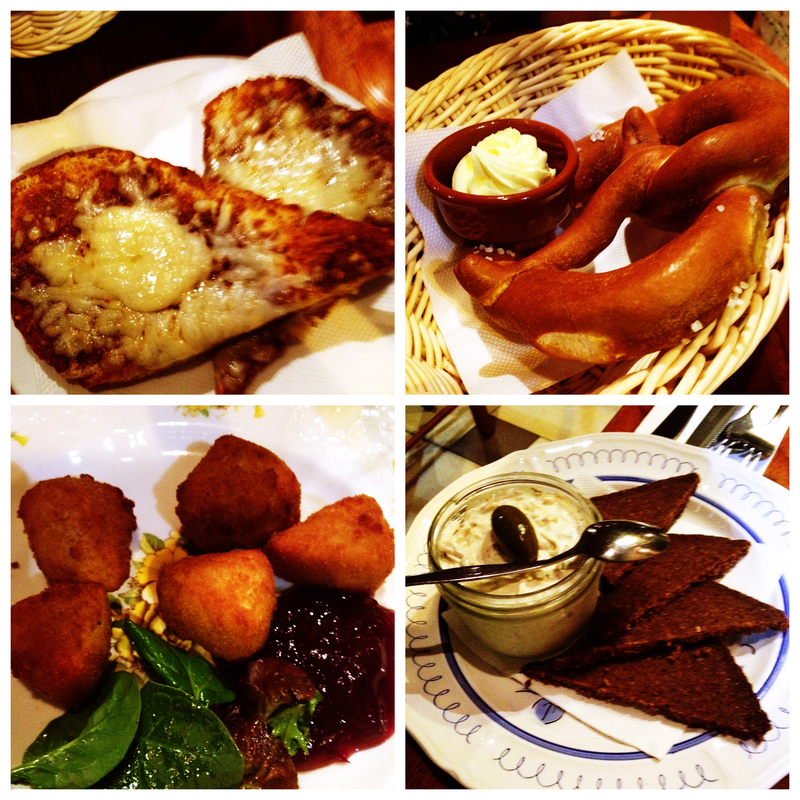 The best way to describe the dining experience at Essen Restaurant and Beer Cafe: comforting. The dishes are honest and simple, full of flavour, and cooked with care and precision. While the majority of dishes on the menu are what is often referred to as “man food”, there are lighter options, including some vegetarian ones. The restaurant itself - while spacious – has a cosy and familiar feeling. If you feel like an experience and meal both packed with warmth and comfort, book into Essen.